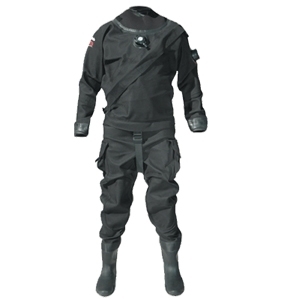 THE EVOLUTION 2 IS A RUGGED, DURABLE, ALL-CORDURA FRONT-ENTRY MEMBRANE DRYSUIT. RUGGED ENOUGH TO BE IDEAL FOR COMMERCIAL AND MILITARY USE, YET COMFORTABLE AND VERSETILE ENOUGH FOR RECREATIONAL DIVERS. The Evolution 2 provides an incredible array of standard features and can be customized for any diver’s needs. 1. YKK zipper is fitted with a protective zipper flap to ensure long zipper life and smoother operation 2. Low profile Si-Tech 360 degree rotating inflation valve 3. Exhaust valve 4. Drysuit hood, suspenders, inflation hose and carry bag are all included as standad items.